Discover the two imperial jewels of Russia! In Moscow, the spectacular Red Square and the immense Kremlin, the two incredible vestiges of the former Soviet Empire, await you. In St. Petersburg, discover the artistic heritage of the Hermitage and the impressive fortress of St. Peter and St. Paul, the ancient pantheon of the Tsars. International flight UK - Moscow, Saint Petersburg - UK. Train from Moscow to Saint Petersburg in 2nd class. 7 breakfasts & 1 Lunch. Transfers in air conditioned vehicle. Letter of invitation to process your visa. It is imperative that you passport details are correct. * For departure on 1 September, the hotel in Moscow will be Novotel Moscow Centre 4* and in Saint Petersburg the Best Western Plus Center 4* or similar. 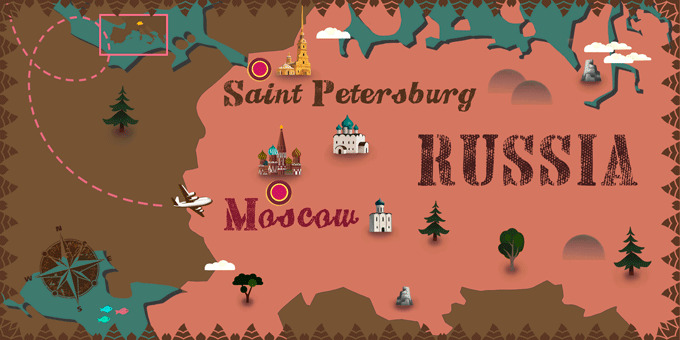 For departure on 1 October, the hotel in Moscow will be Ibis Kievskaya 3* and in Saint Petersburg the St. Petersburg Hotel 3*. And for departure on 6 October, 19 April and 24 May the hotel in Moscow will be Radisson Blu Belorusskaya 4* or Holiday Inn Lesnaya 4* and in Saint Petersburg the Azimut hotel 4* or similar. ** You will have the option to purchase travel insurance in the final stage of the booking. Visa, drinks, tips and any other services not mentioned in what's included. Arrival at the departure airport ready to embark on the flight to Moscow. Arrive in Moscow, transfer from the airport to the hotel. Arrival at the hotel. Feel free to get out and about and discover Moscow at your own pace! Overnight in Moscow. Breakfast at the hotel. Today, discover the Kremlin and its cathedrals, one of the most impressive artistic ensembles in the world. Inside you will see the majestic Arsenal, the Senate, Congress Palace, the Grand Kremlin Palace, the Czar's Canyon and the cathedrals of the Archangel Michael of the Twelve Apostles and the Assumption. In the afternoon, visit the impressive Moscow Metro stations and enjoy a walking tour of lively Arbat Street. Overnight in Moscow. Breakfast at the hotel. This morning, visit the Tretyakov Gallery, which is home to the largest and most impressive collection of Russian fine art. Be amazed by the splendour of your surroundings and the beautiful works of art. Transfer to the station to take the Sapsan Bullet Train, a high-speed train from Moscow to St. Petersburg. Transfer from the station to the hotel for check-in and overnight in St. Petersburg. Breakfast at the hotel. Enjoy a guided city tour of St. Petersburg, the second most important city in Russia known as the "Venice of the North". The historical centre contains a great number of monuments and buildings of baroque and neo-classical architecture. Visit the Fortress of St. Peter and St. Paul and the pantheon of Russian Tsars, which dates back to the time of Peter the Great. In the afternoon, visit Peter & Paul Fortress and then continue discovering this beautiful city at your own leisure. Overnight in St. Petersburg. Breakfast at the hotel. Visit the Winter Palace, former residence of the Russian tsars. In its interior find the most famous museum in the world, the Hermitage, whose collection has more than three million works of art by artists as famous as Rembrandt and Leonardo da Vinci, among others. Later, enjoy a free afternoon in which we suggest visiting the gardens of Petrodvorets to stroll among its beautiful ponds and fountains with waterfalls decorated with dozens of golden sculptures. Overnight in St Petersburg. Breakfast at the hotel. Today, embark on an exciting excursion to Pushkin to visit this fantastic city located 27 kilometres from Saint Petersburg. Visit the luxurious Catalina Palace with its unforgettable Amber Room. With Rococo style and impressive dimensions, this was the official residence of the Tsars in summer. In the afternoon, enjoy some free time. We recommend a boat trip along the canals of the Neva River. Overnight in St. Petersburg. Breakfast at the hotel. Transfer to the airport to board the flight back to the UK. Arrival in the UK and end of your trip. A visa is required to enter the country. This is issued at the consulate before travel with a letter of invitation. 220 V. 2 pin European adapter required. There are no mandatory vaccinations for travellers from EU countries. Due to its size, Russia has great climatic variation however the predominant climate is continental.